It all began with a peach. Once upon a time, God created a spot so perfect for growing sweet peaches. We call it "The Peach State." Out of this very spot grew The Genuine Georgia Group: three guys born and raised in the same dirt their great-great-grandfathers grew peaches in 130 years ago. Their mission was simple: to spread the word in hopes that everyone in the world could taste the sweetest peaches ever grown. From peaches, they ventured in to pecans and then to apples. The rest is history. Five generations of Georgia-Grown goodness. Genuine Georgia Group has a working relationship with all five of the commercial peach farms in the state of GA: Pearson Farm and Lane Southern Orchards in Fort Valley, Taylor Orchards in Reynolds, Dickey Farms in Musella and Fitzgerald Fruit Farms in Woodbury. A sales + marketing cooperative adds immeasurable value to the industry. Consistent supply plus pricing integrity is the name of the game. Over the past two seasons, the growers have increased planted acres by 20%. 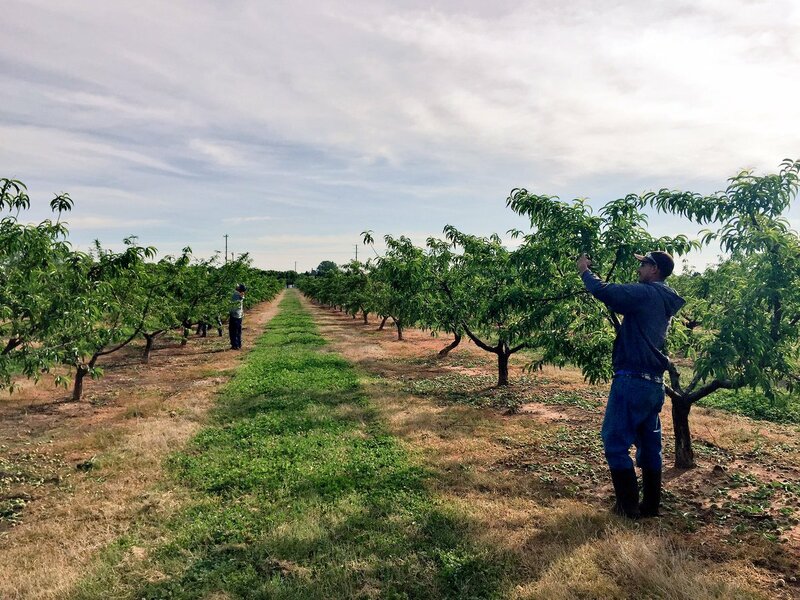 For the first time in over eight decades, the peach industry is booming in Georgia. The Genuine Georgia Group is at the forefront of this growth and will continue to grow with it. Genuine Georgia has expanded with the production of Elliots Brand pecans and the Georgia Apple Company. Each of our products are local + homegrown-good. We promise freshness and we deliver. Georgia has a heritage 150 years long of growing peaches. Today, over 40 different varieties are grown statewide. Each year we produce over 130 million pounds of peaches between mid-May and August. The Elliot pecan is a variety planted predominantly in the Southeast and is distinguishable by its shape and buttery + hickory taste. Sweet Georgia Pecans are available at select Kroger retail locations. Georgia is famous for its peaches but our apples are hard to beat! In 2014, Genuine Georgia founded the Georgia Apple Co., produced by three of our five family farms and are available come August. In 2008, father-son duo, Bill and Will McGehee, formed The Genuine Georgia Group, LLC. Genuine Georgia’s sole purpose was to help sell and market peaches for their family farm, Pearson Farm. The same season a unique bond was formed between Genuine Georgia and Duke Lane III, who was in charge of sales for his family’s farm, Lane Southern Orchards. Relationships are important to Genuine Georgia. They hand-pick their peaches AND their partners. Learn more about Genuine Georgia Here.